Amazon Connect supports identity federation with Security Assertion Markup Language (SAML) 2.0 to enable web-based single sign-on (SSO) from your organization to your Amazon Connect instance. This allows your users to sign in to a portal in your organization hosted by a SAML 2.0–compatible identity provider (IdP). The IdP includes an option to log in to Amazon Connect, which redirects the user to your Amazon Connect instance without having to provide separate credentials for Amazon Connect. To enable SAML authentication, create an AWS Identity and Access Management (IAM) role for federation. The role is used for federation between the your IdP and Amazon Web Services. AWS Identity and Access Management is a web service that helps you securely control access to AWS resources. You use IAM to control who is authenticated (signed in) and authorized (has permissions) to use resources. In this case, the IAM role is used for federation between your identity provider and AWS. The permissions for the IAM role grant access to Amazon Connect. You cannot use your root AWS account as the account for SAML federation. Instead, follow the steps in the topic, and the topics linked to in the AWS Identity and Access Management documentation, to create an IAM role for federation. To learn more about IAM, see What is IAM? 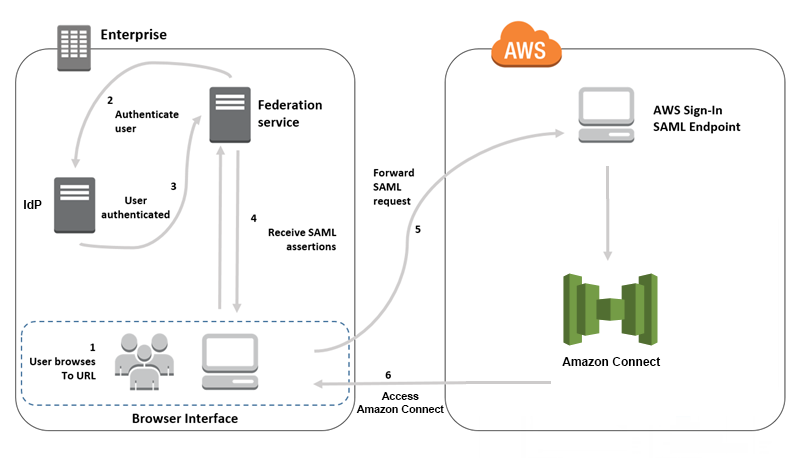 The following diagram describes the flow for SAML requests to authenticate users and federate with Amazon Connect. The user browses to an internal portal that includes a link to log in to Amazon Connect. The link is defined in the identity provider. The federation service requests authentication from the organization's identity store. The identity store authenticates the user and returns the authentication response to the federation service. When authentication is successful, the federation service posts the SAML assertion to the user's browser. The user's browser posts the SAML assertion to the AWS sign in SAML endpoint (https://signin.aws.amazon.com/saml). AWS sign in receives the SAML request, processes the request, authenticates the user, and forwards the authentication token to Amazon Connect. Using the authentication token from AWS, Amazon Connect authorizes the user and opens Amazon Connect in their browser. Create an Amazon Connect instance and select SAML 2.0-based authentication for identity management. Enable SAML federation between your identity provider and AWS. Add Amazon Connect users to your Amazon Connect instance. Log in to your instance using the administrator account created when you created your instance. Go to the User Management page and add users. The user names must exactly match the user name in your network directory and your identity provider. Configure your identity provider for the SAML assertions, authentication response, and relay state. Users log in to your identity provider. When successful, they are redirected to your Amazon Connect instance. The IAM role is used to federate with AWS, which allows access to Amazon Connect. When you are creating your Amazon Connect instance, select the SAML 2.0-based authentication option for identity management. On the second step, when you create the administrator for the instance, the user name that you specify must exactly match a user name in your existing network directory. There is no option to specify a password for the administrator because passwords are managed through your existing directory. The administrator is created in Amazon Connect and assigned the Admin security profile. You can log in to your Amazon Connect instance, through your IdP, using the administrator account to add additional users. To enable SAML-based authentication for Amazon Connect, you must create an identity provider in the IAM console. For more information, see Enabling SAML 2.0 Federated Users to Access the AWS Management Console. The process to create an identity provider for AWS is the same for Amazon Connect. For step 7 in the flow diagram, the client is sent to your Amazon Connect instance instead of the AWS Management Console. Create a SAML provider in AWS. For more information, see Creating SAML Identity Providers. Create an IAM role for SAML 2.0 federation with the AWS Management Console. Create only one role for federation. The IAM role determines which permissions the users that log in through your identity provider have in AWS. In this case, the permissions are for accessing Amazon Connect. You can control the permissions to features of Amazon Connect by using security profiles in Amazon Connect. For more information, see Creating a Role for SAML 2.0 Federation (Console). In step 5, choose Allow programmatic and AWS Management Console access. Create the trust policy described in the topic in the procedure To prepare to create a role for SAML 2.0 federation. Then create a policy to assign permissions to your Amazon Connect instance. Permissions start on step 9 of the To create a role for SAML-based federation procedure. On the Attach permissions policy page, choose Create policy. Copy one of the following example policies and paste it into the JSON policy editor, replacing any existing text. You can use either policy to enable SAML federation, or customize them for your specific requirements. Use this policy to enable federation to a specific Amazon Connect instances. Replace the value for the connect:InstanceId to the instance ID for your instance. Use this policy to enable federation for multiple instances. Note the brackets around the listed instance IDs. After you create the policy, choose Next: Review. Then return to step 10 in the To create a role for SAML-based federation procedure in the Creating a Role for SAML 2.0 Federation (Console) topic. Configure your network as a SAML provider for AWS. For more information, see Enabling SAML 2.0 Federated Users to Access the AWS Management Console. Configure SAML Assertions for the Authentication Response. For more information, Configuring SAML Assertions for the Authentication Response. Replace the region-id with the Region name where you created your Amazon Connect instance, such as us-east-1 for US East (N. Virginia). Replace the instance-id with the instance ID for your instance. You can find the instance ID for your instance by choosing the instance alias in the Amazon Connect console. The instance ID is the set of numbers and letters after '/instance' in the Instance ARN displayed on the Overview page. For example, the instance ID in the following Instance ARN is 178c75e4-b3de-4839-a6aa-e321ab3f3770. Add users to your connect instance, making sure that the user names exactly match the users names in your existing directory. If the names do not match, users can log in to the identity provider, but not to Amazon Connect because no user account with that user name exists in Amazon Connect. You can add users manually on the User management page, or you can bulk upload users with the CSV template. After you add the users to Amazon Connect, you can assign security profiles and other user settings. When a user logs in to the identity provider, but no account with the same user name is found in Amazon Connect, the following Access denied message is displayed. You can import your users by adding them to a CSV file. You can then import the CSV file to your instance, which adds all users in the file. If you add users by uploading a CSV file, make sure that you use the template for SAML users. You can find on the User management page in Amazon Connect. A different template is used for SAML-based authentication. If you previously downloaded the template, you should download the version available on the User management page after you set up your instance with SAML-based authentication. The template should not include a column for email or password. When you use SAML in Amazon Connect, users must log in to Amazon Connect through your identity provider (IdP). Your IdP is configured to integrate with AWS. After authentication, a token for their session is created. The user is then redirected to your Amazon Connect instance and automatically logged in to Amazon Connect using single sign-on. As a best practice, you should also define a process for your Amazon Connect users to log out when they are finished using Amazon Connect. They should log out from both Amazon Connect and your identity provider. If they do not, the next person that logs in to the same computer can log in to Amazon Connect without a password since the token for the previous sessions is still valid for the duration of the session, by default, 10 hours. Amazon Connect sessions expire 10 hours after a user logs in. After 10 hours, users are automatically logged out, even if they are currently on a call. If your agents stay logged in for more than 10 hours, they need to refresh the session token before it expires. To create a new session, agents need to log out of Amazon Connect and your IdP and then log in again. This resets the session timer set on the token so that agents are not logged out during an active contact with a customer. When a session expires while a user is logged in, the following message is displayed. To use Amazon Connect again, the user needs to log in to your identity provider.